This is a great gift for children who love animals & also doing something a bit different. They can join Boston, Gypsy and friends on a Wild West experience, leaping up on their pony for their first western riding lesson, then trying their hand at lassoing the cow horns. There's also a tasty meal of Ranch Burger and Beans. Children spent about an hour and a half with the ponies, and an hour actually riding them Western style in an arena. Mums and dads, you're welcome to watch. The New Forest is a wonderful place to unwind, so why not treat yourself & a loved one to a couple of days away there? 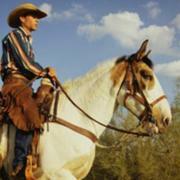 Head out riding amongst the wild ponies & foals. See if you can spot the herds of deer who live in the woodlands. You'll stay at a local B&B on the southern edge of the forest, a short walk from the local pub and from the stables where you'll meet your horse. Beginners and more experienced riders are welcome. The break includes two 2 hour rides in western saddle for novice riders or traditional saddle for riders who are able to trot or canter. Please note there are no ride gallops or jumps. 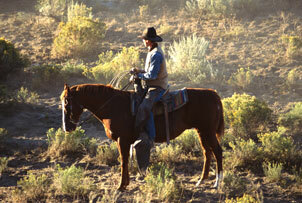 After a health & safety briefing from your trail leaders, mount your horse & head off on a mounted instruction, Cowboy Style! Then it's off across the New Forest, riding over heathland & through the woodlands. Back at the ranch, there's a BBQ cooking so that when you get back, full of fresh air and exercise, there's hot food, soft drinks and coffee waiting for you. Most of the riders have never been on a horse before, so if you fancy trying this sort of riding out, this could be just the experience for you. 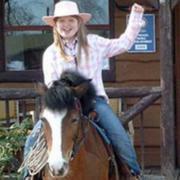 Start your day with ‘bacon and egg sarnies’ to get you going, then groom & tack up your horse. There's a riding lesson before a lunch break with 'chicken n steak’ for you & hay for your trusty steed. 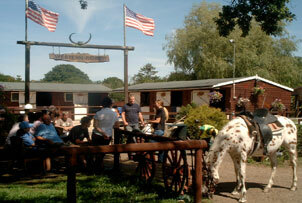 Ride in the New Forest among the wild ponies & into the woodlands, before giving your horse a rub down. Trail leaders are on hand to help you throughout the day. Virgin says that you don't have to be a John Wayne for this experience & that most of their riders haven't been on a horse before.